Nick Cimino believes that genealogy is a path towards reconciliation and reunion with families transcending the boundaries of time and space. Contact Nick if you want help with your own research or if you are looking for a speaker willing to share tips and tricks on how to assemble your "Ancestor Puzzle." I would like to introduce you to my new Sicilian DNA cousin, Kevin Cunningham of Omaha, Nebraska. He does not have an Italian surname but he is more immersed into the culture of the Little Italy of Omaha than I could ever hope to be. Kevin is one of my DNA matches through AncestryDNA and we have been getting acquainted over the last several weeks. Omaha, Nebraska was a place of refuge for thousands of Sicilians from the towns of Carlentini and Lentini in the early decades of the 20th century. 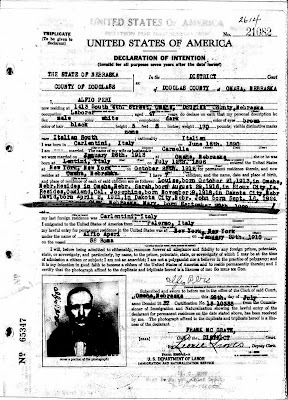 My great grandfather, Antonino "Tony" Cimino came to the U.S. in February 1909 and his wife, Maria Ossino and three children followed him to Omaha in March 1911. Our connection to Kevin is through this great grandmother, Maria Ossino. 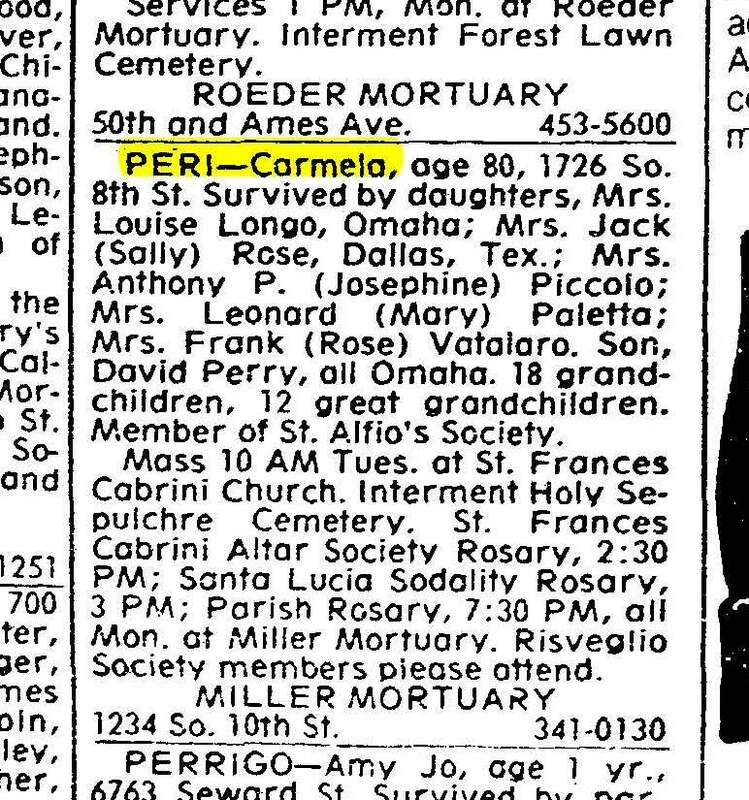 Maria had a sister, Carmela who was Kevin's grandmother. Here is a picture of Kevin's grandparents. Carmela Ossino and her husband Alfio Peri in Omaha, Nebraska, 1950. The exact date for this photo is 23 Sep 1950, the wedding day of Leonard Paletta and Mary Peri. Photo courtesy of Kevin Cunningham of Omaha July 2017. This picture was taken in front of the house at 1728 S 8th Street in Omaha. This is the house next door to where they lived. The reason that I was able to contact Kevin was thanks to the fact that my dad's first cousin, Sam Cimino had performed a DNA test on AncestryDNA. Sam showed up unexpectedly one day as one of my close DNA matches. I also have my dad's DNA in the system. It is always reassuring to have your close cousins confirmed as a DNA match but the unexpected bonus was that I was able to get a list of people that showed up as "Shared DNA Matches" and Kevin Cunningham was on that list. I noticed that Kevin did not have a family tree on Ancestry.com so it was very difficult to know exactly how we were related. I sent him a note through the anonymous contact service at Ancestry.com to ask him if he knew of any ancestors from Carlentini and Lentini. He replied that yes indeed his grandparents were from Carlentini. "My grandmother's maiden name is Ossino. 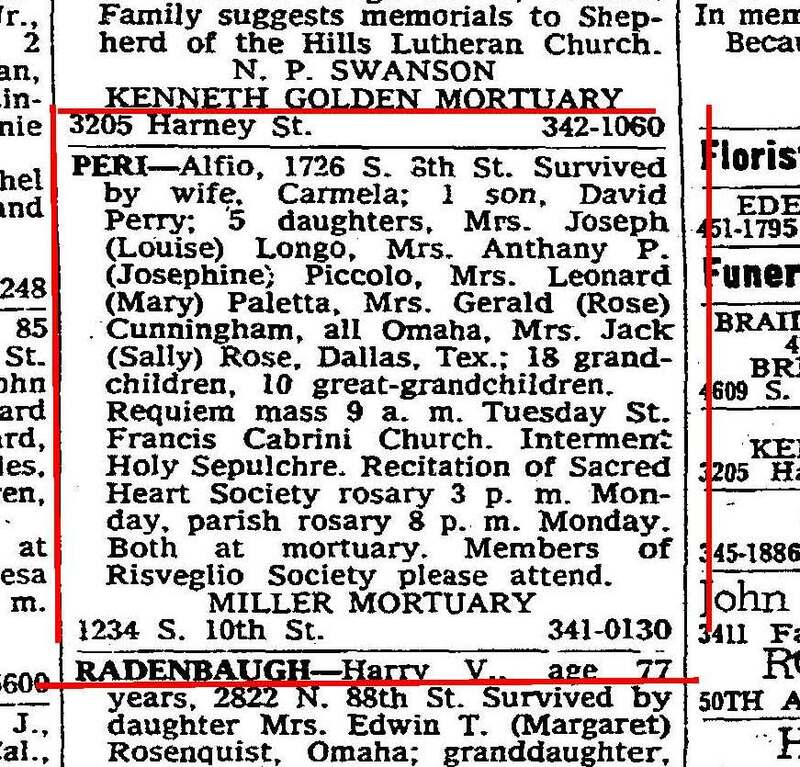 She also had a sister that married a Ferraguti here in Omaha. There were a lot of immigrants that settled in Omaha from Carlentini. My mom is the last surviving sibling and her memory is failing. Any documents have been lost to time. 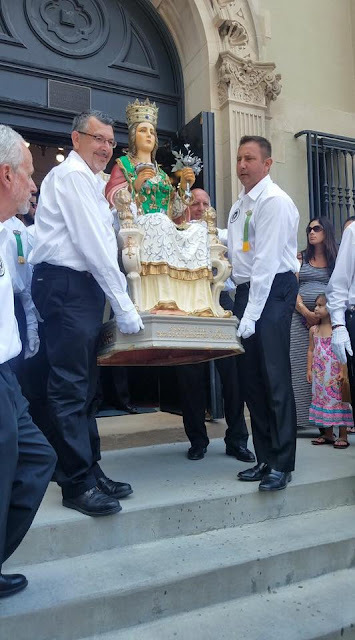 Omaha just finished celebrating the Santa Lucia festival. I do not know if you are familiar with the festival and this saint but it is a good story." I asked Kevin if it was possible that we could talk on the phone. I told him that I would love to know more about his family in Omaha and the Santa Lucia story. We never knew much about our Carlentini heritage growing up in California. He quickly responded with his phone number and we have had several phone calls, text messages and emails sharing information with each other since. We were off to the races in terms of finding our ancestral connection. 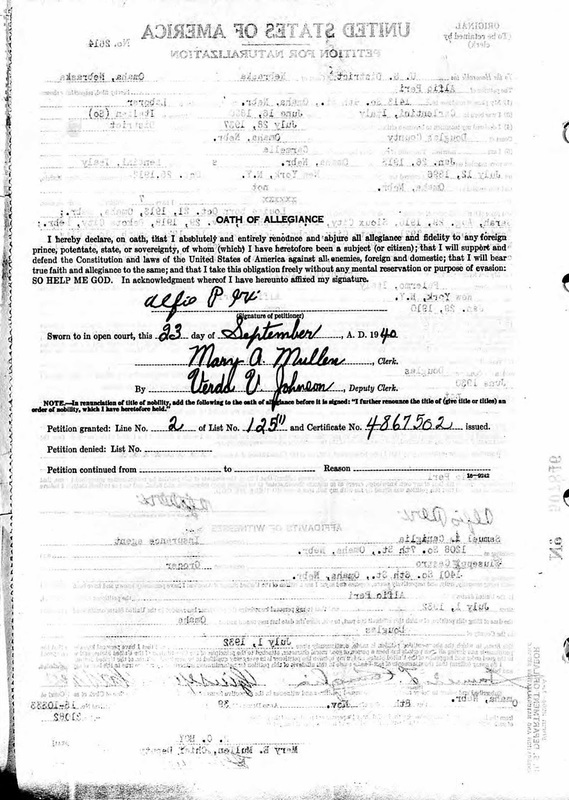 I offered to add his family information to my online tree at Ancestry.com and I was able to figure out our exact connection. 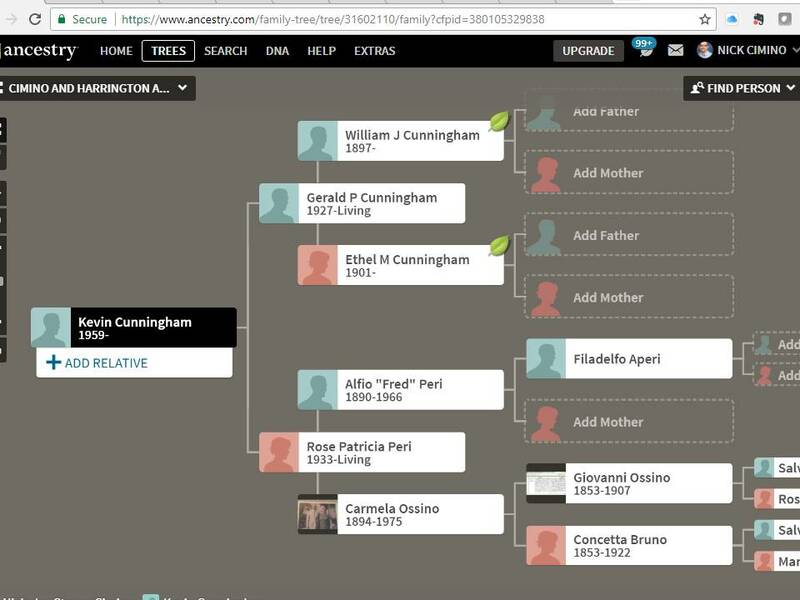 His grandmother, Carmela Ossino and my great grandmother, Maria Ossino, were sisters and our shared ancestors were Giovanni Ossino and Concetta Bruno shown on the chart below. 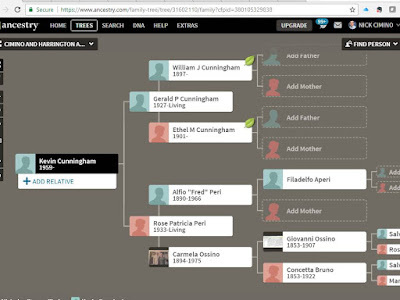 Our shared ancestors are Giovanni Ossino and Concetta Bruno. Kevin also let me know that his grandparents had also lived in Sioux City for a period of time like my family did. Kevin's grandparents returned to the friendly confines of the Little Italy neighborhood in Omaha. 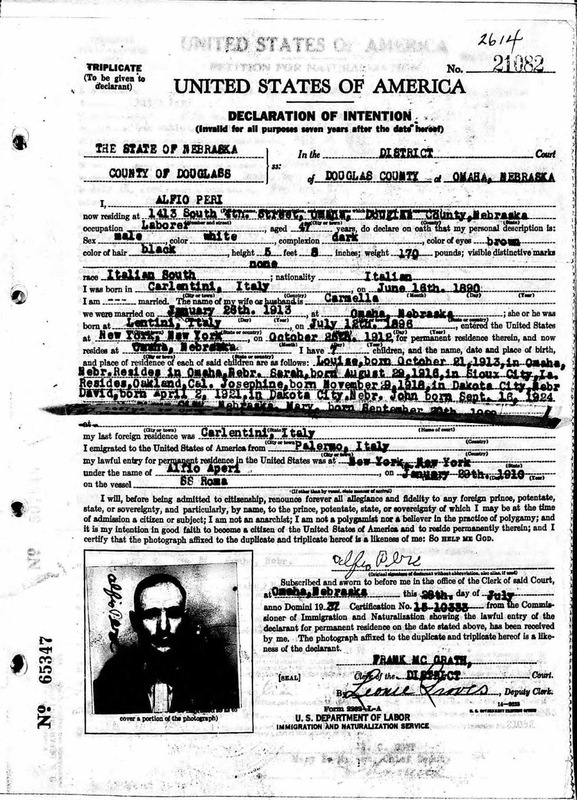 The records show that Alfio "Fred Peri arrived in the U.S. in January 1910 and resided in Omaha until 1915. Fred and Carmela had a daughter, Sarah that was also known as Sally born in Sioux City in 1916 and two children, Josie and David were born in Dakota City, Nebraska in 1918 and 1921. 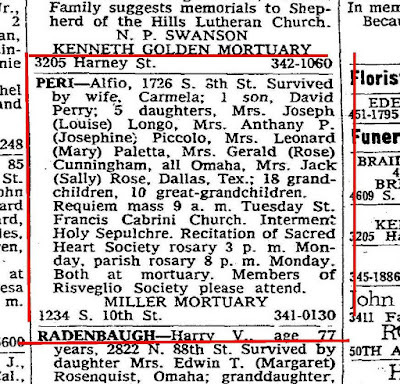 A son, John Peri was born in South Sioux City, Nebraska in 1924 and a daughter Mary Peri was born in Omaha in 1928. 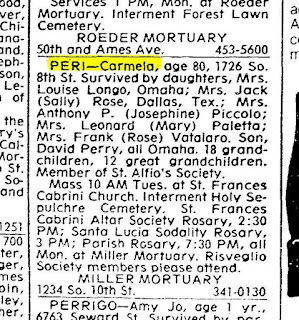 The family stayed in Omaha until Alfio "Fred" Peri died in 1966 and his wife, Carmela Ossino Peri died in 1975. 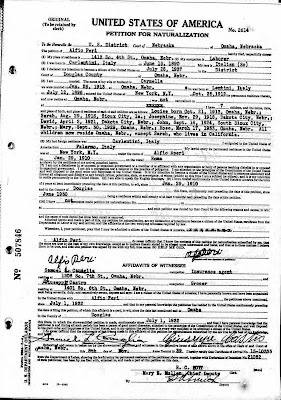 The most revealing documents about the Peri family birthdates were the naturalization papers for Alfio "Fred" Peri. 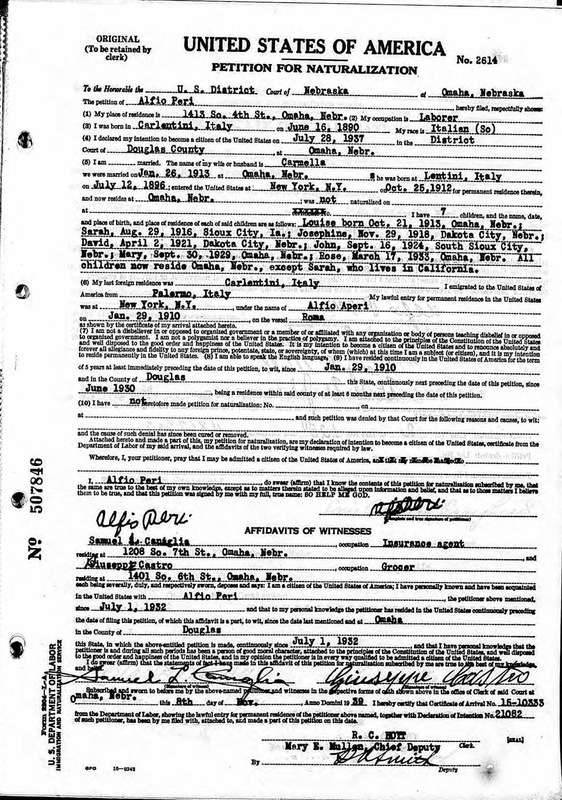 These papers also reveal that he immigrated under the name Alfio Aperi and that he shortened his name to Peri when he arrived in the U.S.
DNA opened the door to a lot of fun for me connecting with Kevin and learning about his family history. If you need any help making DNA connections, please feel free to contact me. Do You Have Famous Kin? Can You Prove It? An Italian Wedding in Sioux City, Iowa? My DNA Results & Surprises! Italian Heritage-Our Nonnu Served in the Italian Military! Do You Need a Genealogy Pro? (c) Nick Cimino, 2011. Picture Window theme. Powered by Blogger.